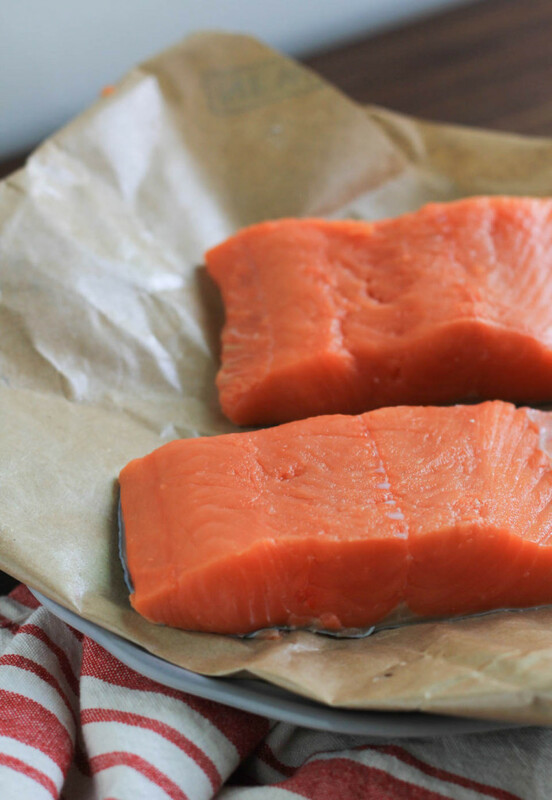 It’s Friday, it’s Earth Day, and it’s the perfect day to share a beautiful salmon recipe from one of my mentors, Diane Morgan. 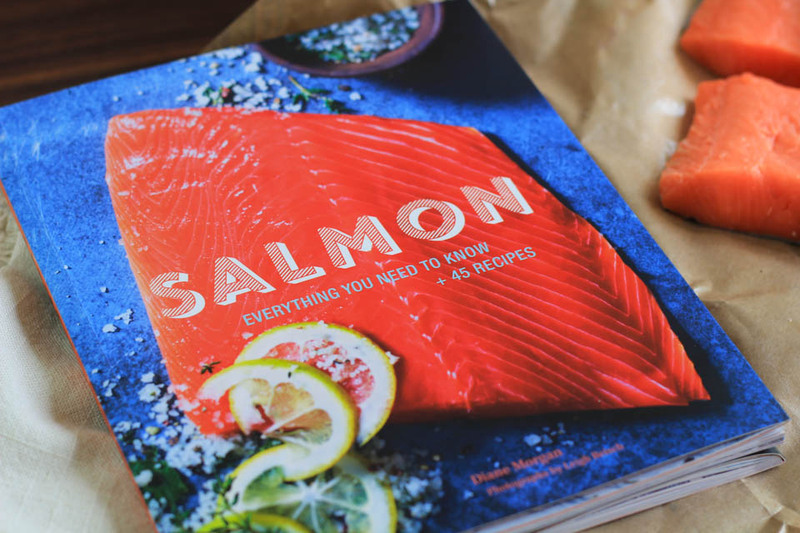 It’s a perfect day for this simply because this gorgeous Salmon Cookbook comes from a place of sustainability, respect for nature and all things natural, seasonal eating, and all of the things I love about working with Diane. A few years ago I persistently emailed Diane about working together, and learning from her. She is a fantastic, award winning cookbook author and has written seventeen cookbooks! Now you see why I reached out to her right?! I worked with Diane on a few projects in town, she also lives in Portland. Shopped at the farmers market, ate lovely pastries, and talked shop about food, naturally. I cooked for her cookbook classes she held here in our area, that is where I learned so much for my site. Mainly how to properly write recipes, and it helped me so much to hone my recipe writing skills and techniques. While I have the chef and cooking school background, I wrote like a chef in my recipes, which isn’t much help for the home cook. That perspective has grown my site into a reliable and approachable place for people to find recipes. That is exactly what Diane does in all of her books. And lets be honest here, you don’t get seventeen cookbook deals if your recipes are not perfect! Her books are full of knowledge, researched and studied. Reliable is a key ingredient you find her recipes, and that is super important when you go to make something from someones book. You want it to work, and with her recipes, it will. Diane’s cookbook, Salmon, is the perfect example of that, a reliable resource and wealth of knowledge on one subject. It teaches you the sustainability of salmon, where to buy it, what to look for in a good piece of fish, farmed vs. fresh. She travels to places to learn about her subject, that type of knowledge is very helpful to a reader who knows nothing about salmon. How many people know that they are buying crappy, farm raised, antibiotic filled fish? Sadly, not enough. You’ll learn about Atlantic vs Pacific, raw preparations, stovetop cooking, braising, oven baked, from a to z there something to be learned from this book. She gives us that information to make good choices when buying this beautiful, nutritious, and super gorgeous food. When I buy cookbooks, I often forget how much I can learn from them, other than getting recipes. And that is my most favorite part. Yes, I love food, especially well made food. But to be able to open this cookbook and learn more about the source of my food, then make a great recipe, that is perfection in a cookbook. You’ll learn, cook, and fall in love with the perfectly cooked salmon, I promise. 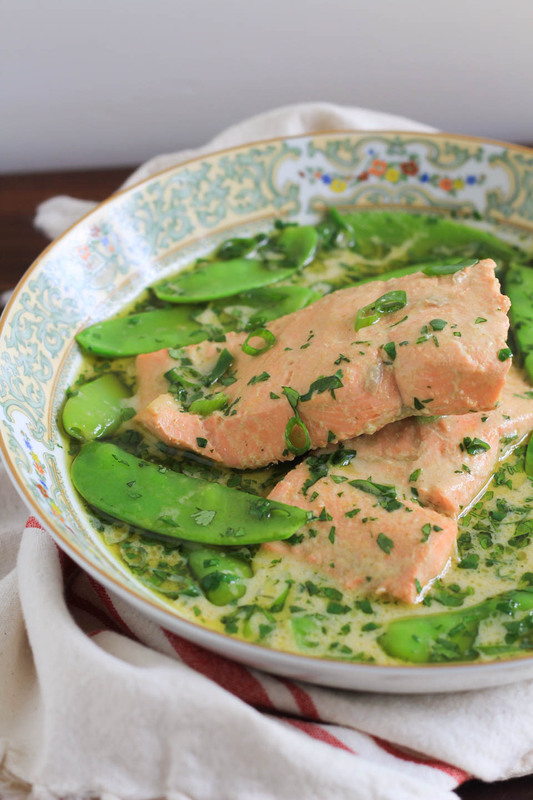 You’ll find this recipe for Green Curry Braised Salmon super approachable, quick to put together, and packed with tons of beautiful spicy flavor! Remove salmon from fridge 30 minutes before cooking. Open the can of coconut milk without shaking. Using a spoon, scoop the top layer of thick coconut cream that settles on the top, place in a small bowl. Place coconut cream in a large sauté pan over medium low heat. Add curry paste, whisk until smooth and simmers. Add brown sugar, stir to combine until dissolved. Add coconut water from the can, water, and fish sauce, bring to a simmer, stir a couple of times. Add salmon in single layer, turn heat to low, cover, and cook for 5 minutes. Flip salmon, cover, and cook for 2 minutes. Add peas to liquid, cover, and cook until peas are bright green and salmon is cooked through, about 2 minutes. Remove pan from heat. Place salmon on a dinner plate or shallow pasta bowl. 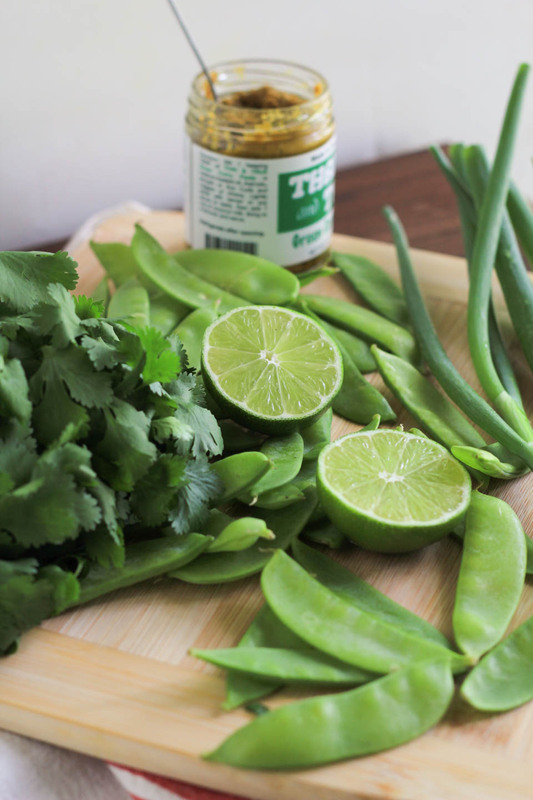 Stir in lime juice, green onions, and cilantro into the curry sauce. 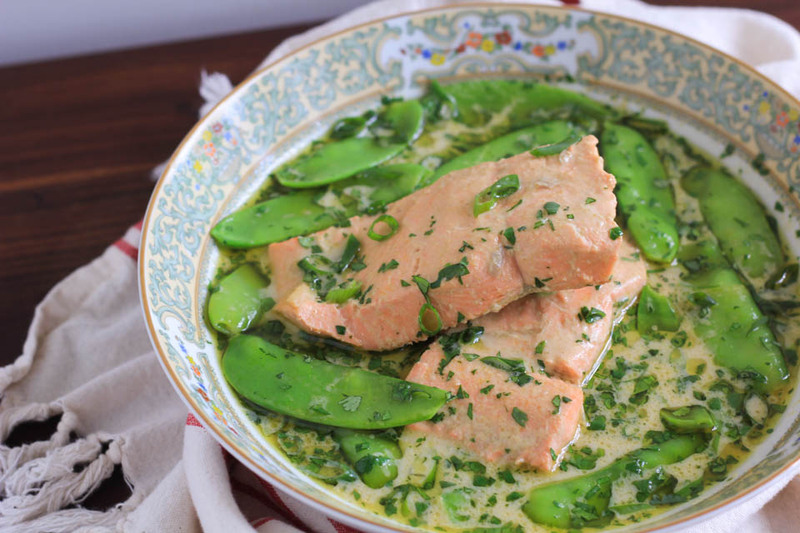 Spoon curry sauce and peas around the salmon, dividing the sauce and peas evenly. Serve immediately. I served this with cooked jasmine brown rice. This looks So fresh and vibrant! Just wonderful, I need to make this! I need to get my hands on that cookbook! I love salmon, but I always find myself cooking it the same way over and over again. This curry sounds super tasty. You totally do! It is fantastic, I hope you love it. That sounds like just the cookbook for me. I love love love salmon and unfortunately haven’t had any in weeks while traveling in Bolivia – not exactly a coastal country, so totally living vicariously through you and this delicious recipe! How fun you were in Bolivia! That is awesome. Salmon can wait for you to get home :). I hope you had a great trip!